The Community Meal, offered on the fourth Saturday of the month, is prepared by parishioners for anyone who is hungry and would like to eat in community. Established in 2005, the Community Meal is a helpful resource for those working hard to feed themselves or their families, as well as those who would like to share a meal in a safe supportive dining atmosphere. We welcome anyone who would like to help prepare meals. Every month, St. Augustine's members donate food (canned goods and pantry items) for the Food Basket outreach at Sacred Heart Roman Catholic Church. In addition to being a fundraiser, our annual bazaar also serves as a great community outreach and witness to the community of the fun, fellowship and hard work our members provide for this event. Our affordable and ono food is a main attraction as are the many other items people can purchase at affordable prices. Christmas Food Basket Vouchers: St. Augustine's contributes to the Food Basket to be issued as vouchers good at the local grocery stores. These vouchers allow local families in need to supplement their Christmas celebrations. 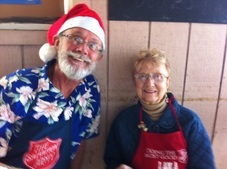 Salvation Army Bell Ringers: St. Augustine provides volunteer bell ringers at Takata Store during the Christmas season for 4-5 hours a day. Keiki Shopping Spree: We sponsor a keiki shopping spree when children come and shop for their Ohana at our Thrift Store. Vouchers (distributed to the children who attend the Feast of St. Nicholas) are redeemed for gifts of their choosing. We provide shopping help and free gift wrapping. Thanksgiving: We provide the use of Walker Hall for the annual Thanksgiving lunch prepared and served by The Gospel of Salvation congregation. We are the first church in Hawaii to commit to the 2 year Green Faith program. Green Faith's mission is to inspire, educate and mobilize people of diverse religious backgrounds for environmental leadership. Their work is based on beliefs shared by the world’s great religions - we believe that protecting the earth is a religious value, and that environmental stewardship is a moral responsibility. Spirit - We celebrate Holy Eucharist at Keokea Park or Kapa'a Beach Park two times a year. We pray at the peace pole the second Sunday of the month, a testimony to the community. Stewardship - FOOD: We host ethnic cooking classes during the summer: Sushi, pancit and laulau. In Spring 2013, extra produce and food were sold at thrift shop, some donated by local farms. WASTE: HI-5 and recycling collections. Food scraps collected after fellowship and other functions for animals. Environmental Justice - This group has been in touch with local hunting and fishing clubs/individuals to help support hunting and fishing issues. Lani met with middle school students who are working on these issues. 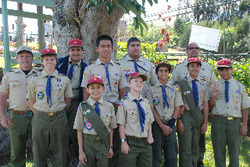 ​James Walker Hall plays an integral role in the community as a venue for many of the our local Kohala groups and organizations such as the Boy/Cub Scouts of America, Girl Scouts of America, the RMD Taiko Drummers, Community Partners, Ohana Conferencing, the Community Development Plan Committees and Sub-Committees. For information about renting James Walker Hall, contact: admin@staugustineskohala.com. Our church has developed an important relationship with Kohala’s Hope for Haiti, a community coalition dedicated to the establishment of an ongoing relationship between the town of Marigot, Haiti and North Kohala to help Marigot with a long-term economic stability project. Though not an officially sponsored church project, we have on several occasions joined together to further this worthwhile endeavor. © 2016 St. Augustine's Episcopal Church (Big Island). All Rights Reserved.